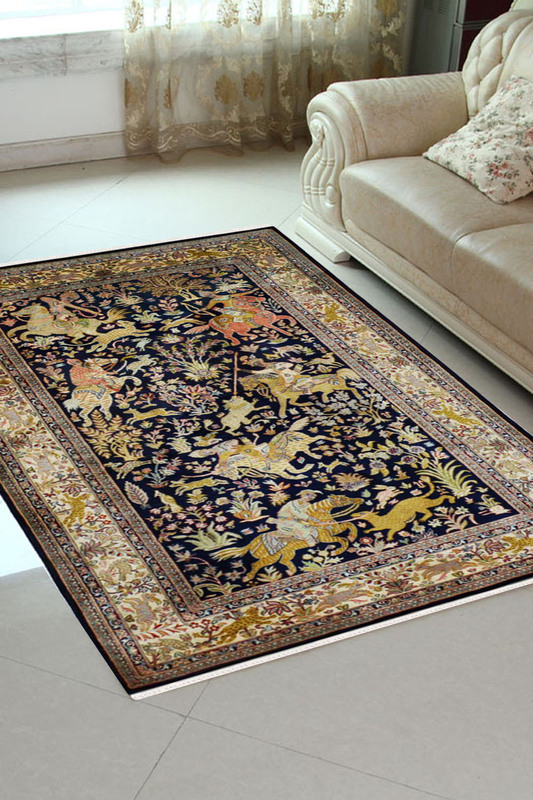 - Hunting design with a series of various kinds of animals intricately woven as a pictorial rug. - Due to its bright colors, this rug would add vibrancy to any space it is placed in and is perfect as a Wall-hanging. - This is a Handmade Kashmir Pure Silk on Silk rug. - This rug is Handmade in silk base and has pure Kashmir Silk on top. - Primary colors are royal blue with a gold floral border. - The center of the rug is a scene from the late 18th century war in Persia. - This rug requires high maintenance due to its high quality and suppleness. - Our recommendation is to use this beauty as a Masterpiece and adorn your feature wall with it.